My new favorite technique is watercolor painting; today I am sharing a fun Birthday card for any age using watercolors, a Jillibean Soup stamp set and Jillibean Soup papers. I started out with watercolor paper and stamped the balloons with Surfaces black ink (any waterproof ink should work). Then I let the ink dry and chose a cool watercolor palette of purple, blue and green. Then I painted the balloons with the watercolors, the best part is that you don’t even need to stay in the lines! Next I chose a complementary green paper as a mat and attached the dried watercolor piece to it. Then that panel was attached to a plain white card base. Then I added a couple Jillibean Soup Birthday Bisque Peapod diecuts and a “Make a Wish” Sticker. Presto, a quick art inspired card versatile enough for almost anyone. The watercolor trend is really hot right now and I have really enjoyed learning the fun techniques out there. Have you added watercolor painting to your projects yet? Hello and welcome to the Hampton Art blog... it's Melinda with you again today and I'm going to share how I put this 'enjoy the journey' card together using a combination of Hampton Art and Canvas Corp products. To begin with I cut and folded my card using an ivory cardstock and rounded the bottom corners. Folded measurement 5.25" x 7". Next step was to prepare my layers. - Firstly I cut my top piece (blue & ivory chevron) of cardstock to 3" x 5.75"
- Second layer ( Coral & Ivory Ribbon Stripe) 3.25" x 5.75"
- Third layer (Blue & Ivory Chevron) 3.5" x 5.75"
When using layers on my projects I tend to start from the front and work my way backwards which probably isn't the most stream-lined approach but it's what I've found works for me. I adhered all layers using foam pop dots to create dimension. 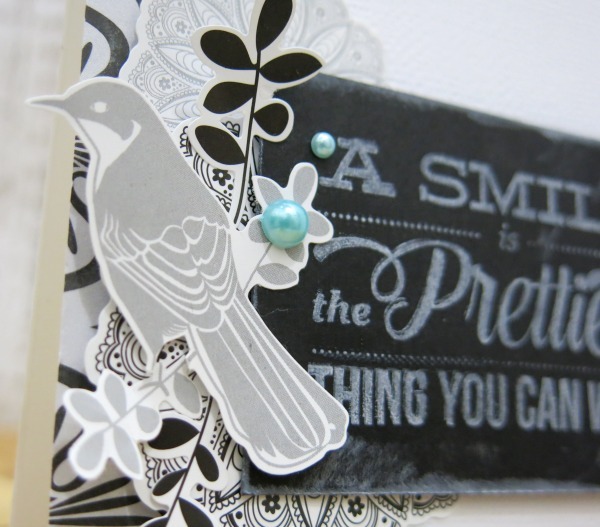 I stamped the sentiment directly onto the bottom of the card using the Colorbox black chalk ink pad. However I wanted a slightly faded, shabby look so stamped a scrap piece of cardstock first to remove the first impression of ink. Embellishing is always the most fun so I played around with a combination of the Canvas mini triangle, thread, seashorse & starfish fussy cut pieces from the Beach Sampler cardstock and a scattering of sequins and epoxy dots. 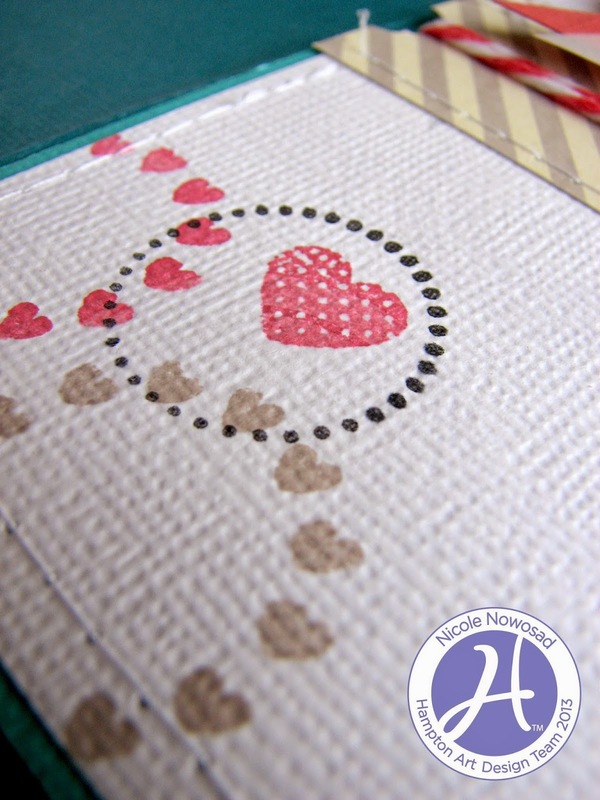 A really fun and easy way to add texture to any card is to use fabric. 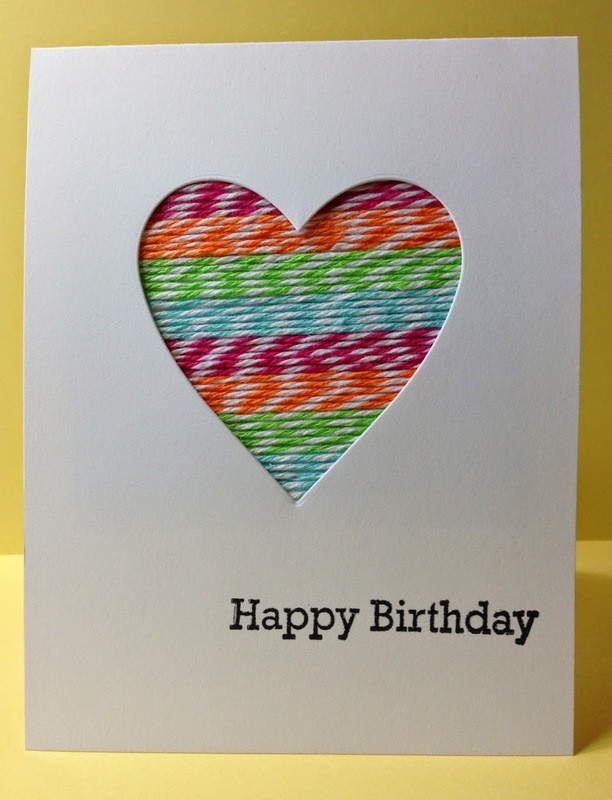 I had some Canvas Corp burlap and canvas in various colors and used a few scraps to make this card. 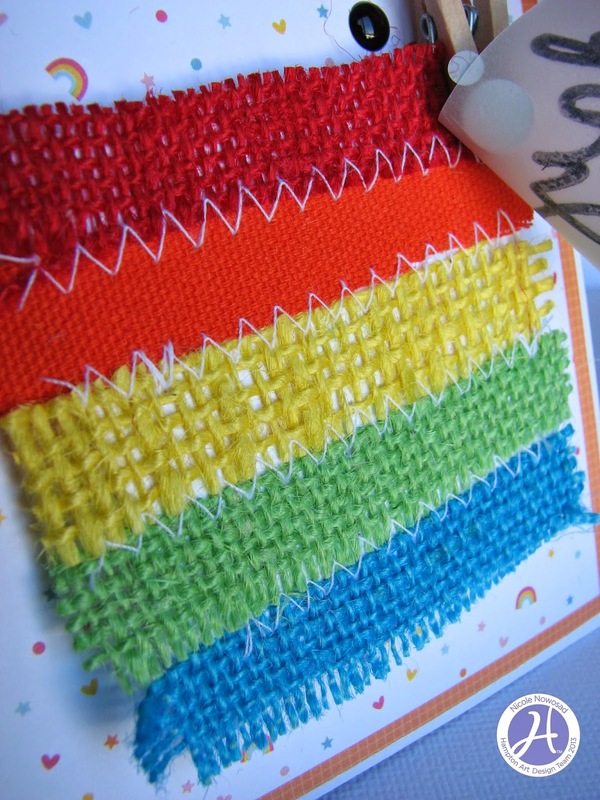 Quite simply, cut some ½” strips of each color of canvas or burlap. Stitch together to create a rainbow! 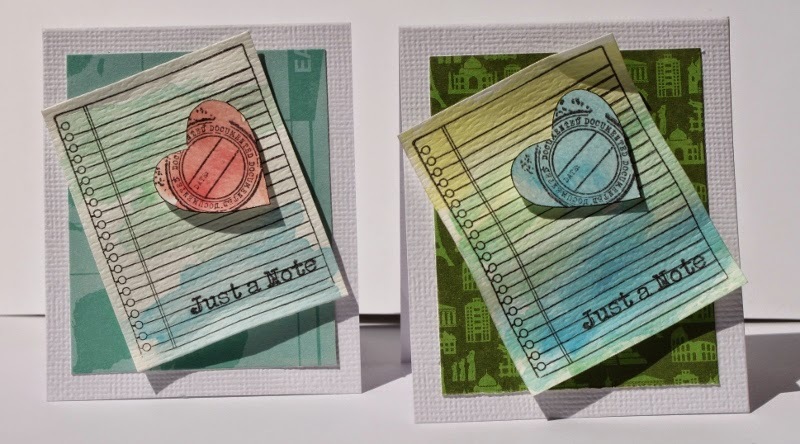 Add a stamped sentiment onto vellum so that the rainbow is still loosely showing through using the great Jillibean Soup handwritten sentiments stamps. Just add in some enamel dots and Canvas Corp clothespins and your card is complete. Did you know that Hampton Art sells more than paper craft supplies? 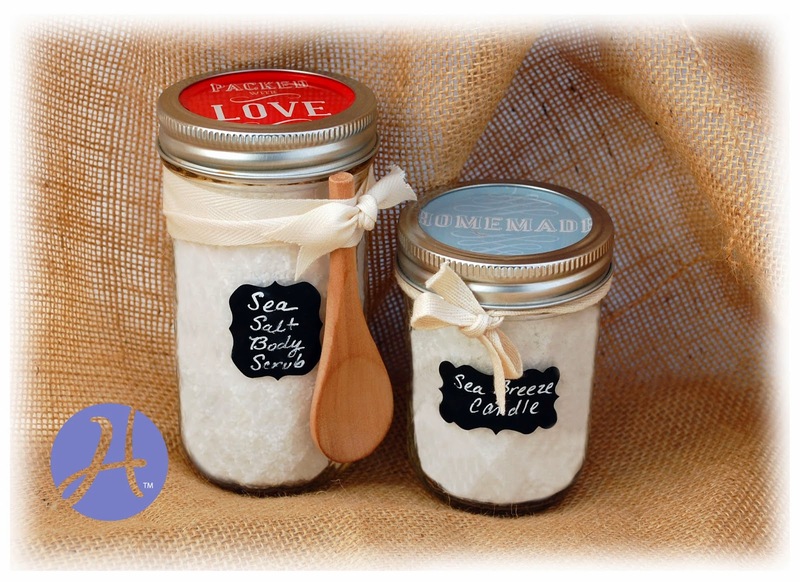 We have other great supplies that are perfect for many gift giving and crafting projects! 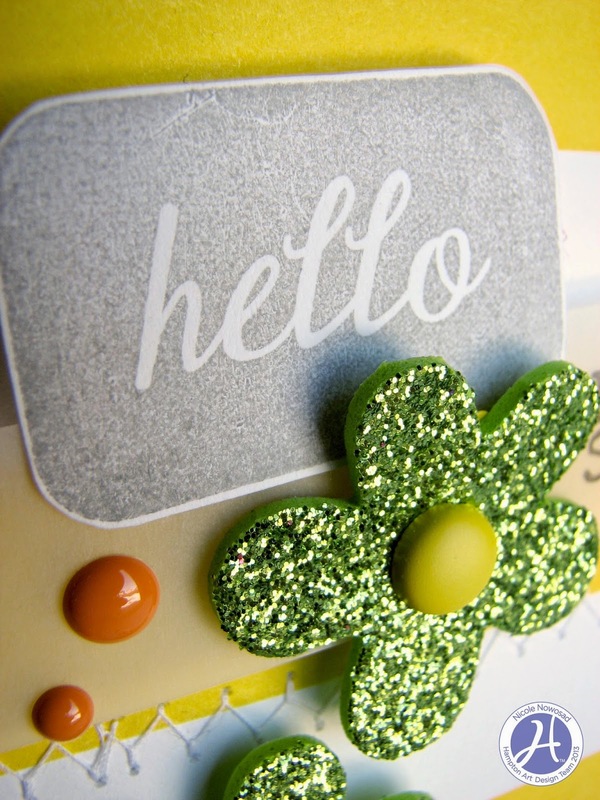 Hello and welcome to the Hampton Art blog... it's Melinda with you today and I'm sharing a non-themed card I created that simply says 'hi'. Sometimes I find I have a drawer full of cards for birthdays, weddings, anniversary's etc but never a card to send to someone just because! 1. Firstly I cut and folded my card so that it measured 5" x 4" folded. 2. The patterned paper panel (5" x 3.75") was adhered using pop dots and positioned to the right of the card which allowed the 1/4" overhang on the left. 3. The white top panel (5" x 3.5") was embossed first and then adhered in position. 4. 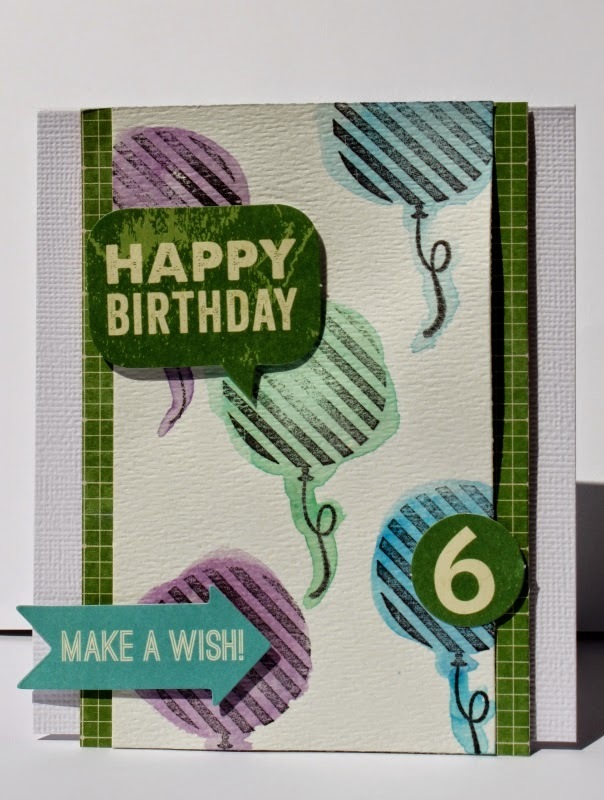 All the embellishing elements to the card were layered, again using foam pop dots and then to finish the card I added a few gems and then finally the die-cut wise word sticker sentiment. 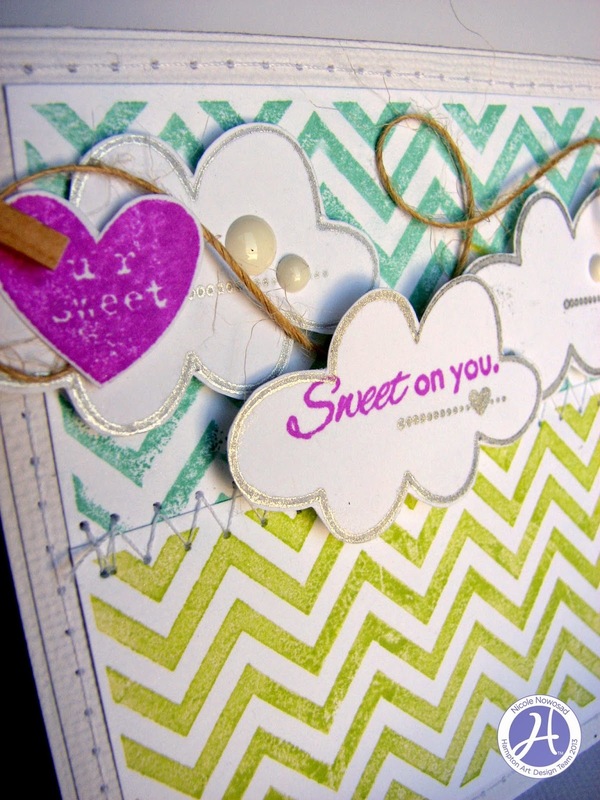 Here is a really simple way to make a sweet card for a friend. Using the chevron pattern stamp by Canvas Corp, stamp with bright colored ink onto smooth white cardstock, using two different colors of ink. 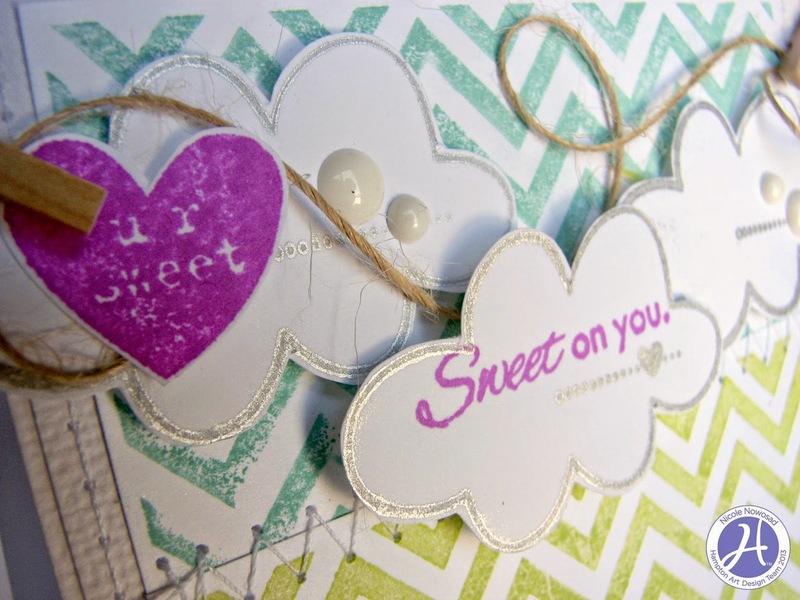 Stamp the cloud shape from the Bella Blvd Kiss Me Stamp set, using metallic colored ink onto white cardstock. Stamp a sentiment to one of the clouds. 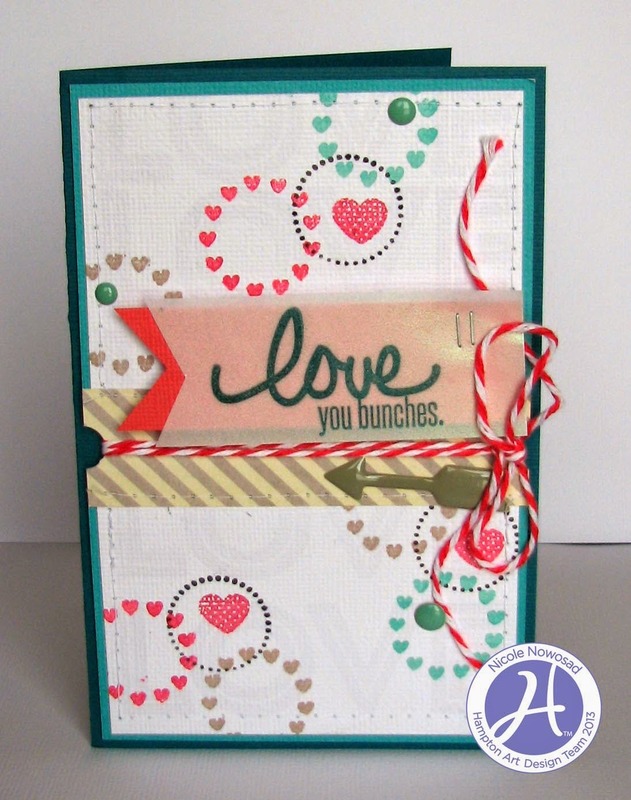 Add a little machine stitching to join your two stamped colors together and your card is complete! Today I wanted to share a fun boy card with a flying theme. It features a Hampton Art/Echo Park Stamp Set and Echo Park papers with some KI Memories papers added in. The tag is what makes this card unique, it is made out of wood! That’s right the helicopters and sentiment were stamped directly onto a wood tag in brown ink. 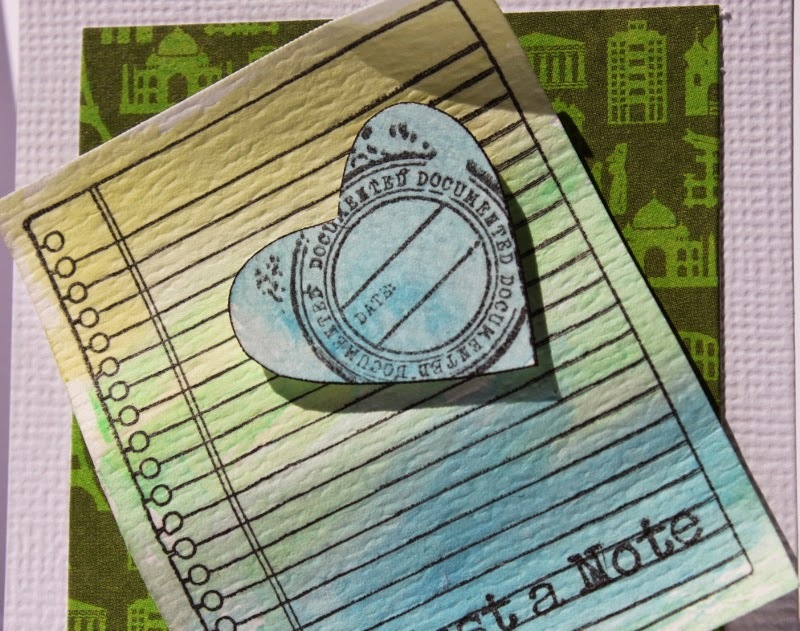 Then the tag was backed with a turquoise solid paper and attached to an Echo Park journal card. Then I added in a Jillibean Soup “Today” tag diecut to the left side as shown. 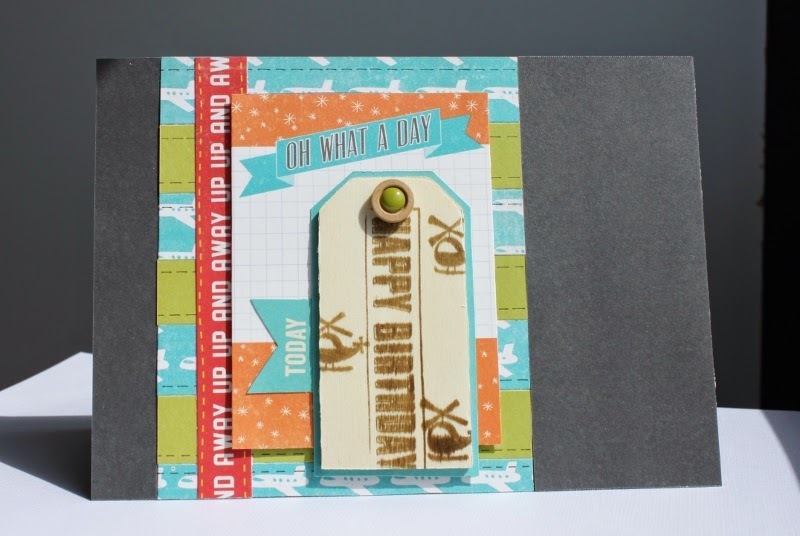 The base of the card was made with some solid gray cardstock and strips of Echo Park paper and green solid. On those strips I added faux stitching with a journaling pen in black. The red “Up, Up and Away” border strip was added vertically as shown. Then the journal card was added with 3D foam dots as pictured. To finish it off I added a Jillibean Soup green wood sprinkle to the tag hole. There you have it a playful boy themed card to share on that next special birthday! Graduation season will be here soon, and I thought these bold Studio G / Hampton Art clear sentiment stamps would be perfect for that. Wouldn’t it be fun to customize them with the school colors of the graduate? It might be hard to tell, but I also used some Studio G / Hampton Art Mini Cards as cardstock. 1) Stamp the sentiment on watercolor paper with archival ink. 2) Add some Distress Inks directly to your craft sheet. 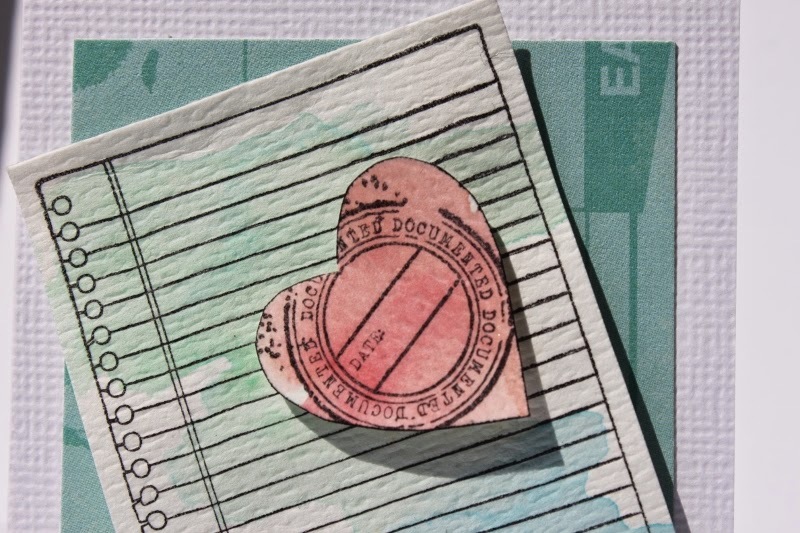 3) Use a water brush to pick up some of the ink and fill in the open parts of the stamp. Hey Hampton Art fans! 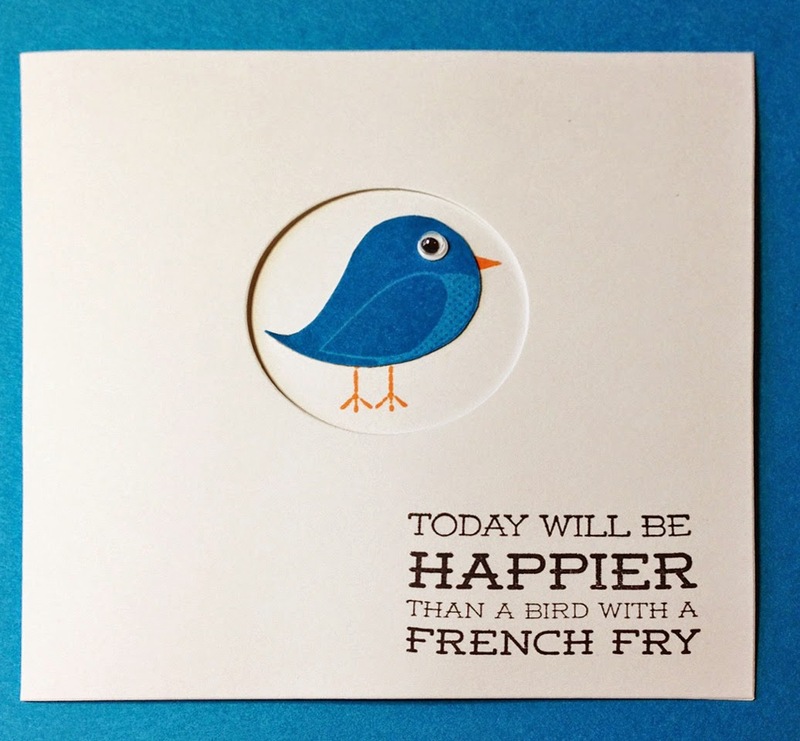 Here is a simple card you can make to brighten someone’s day. Simply trim some Canvas Corp yellow striped paper to 4x4 and add some machine stitching to some of the sections. 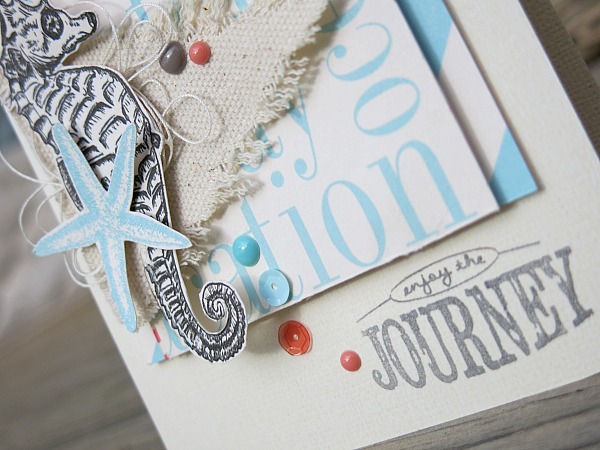 Stamp your sentiment with some Bella Blvd Sand & Surf Stamps on vellum and attach to your card. Stamp the Jillibean Soup word bubble with gray ink and layer over the vellum slightly. Stick on a few sparkly KI Memories foam flowers with a brad or enamel dot to the center and you are done! 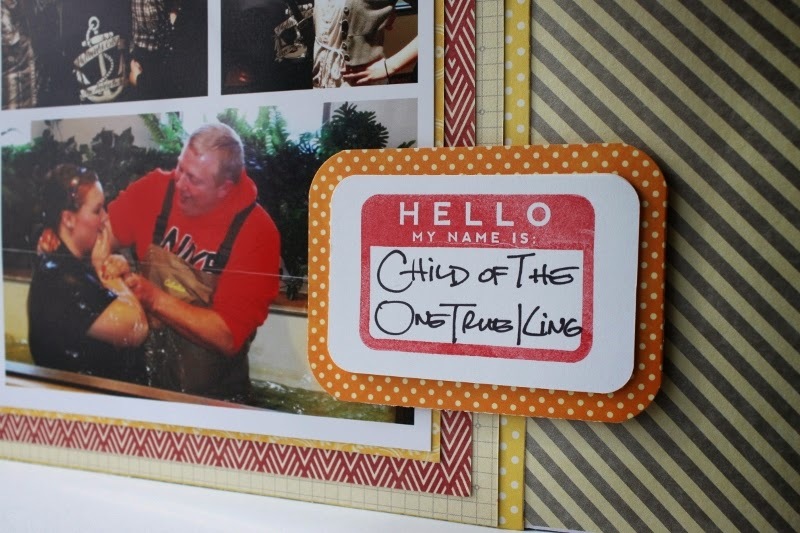 This layout was completely inspired by the Hello My Name is stamp and the popular Christian song by Matthew West, Child of the One True King. It occurred to me that these stamps would be the perfect complement to my daughter’s baptism photos. I began by pulling out my Jillibean Soup/Spicy Social stamp set. 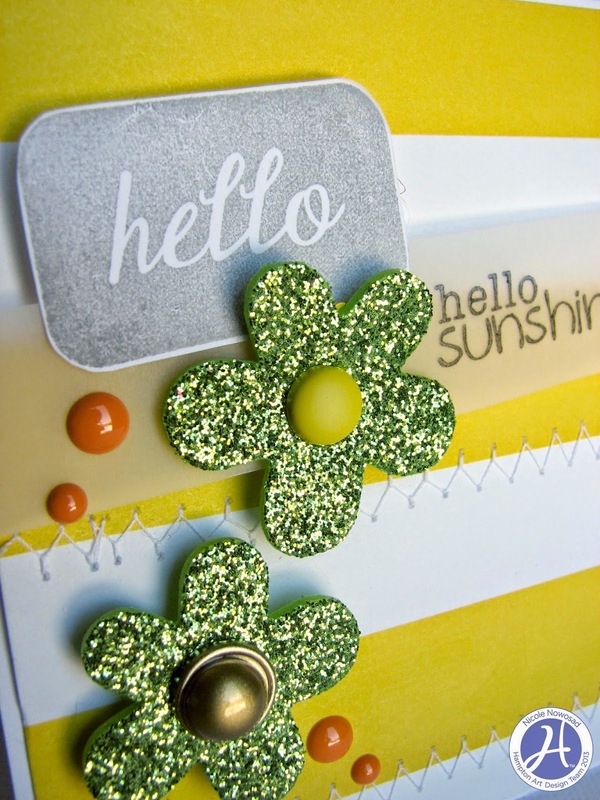 Then I stamped the circle “Hello” stamp in yellow ink off center on the sunshine mini placemat. Then I continued with the watercolor paints and added some sunshine colors to the mini placemat. 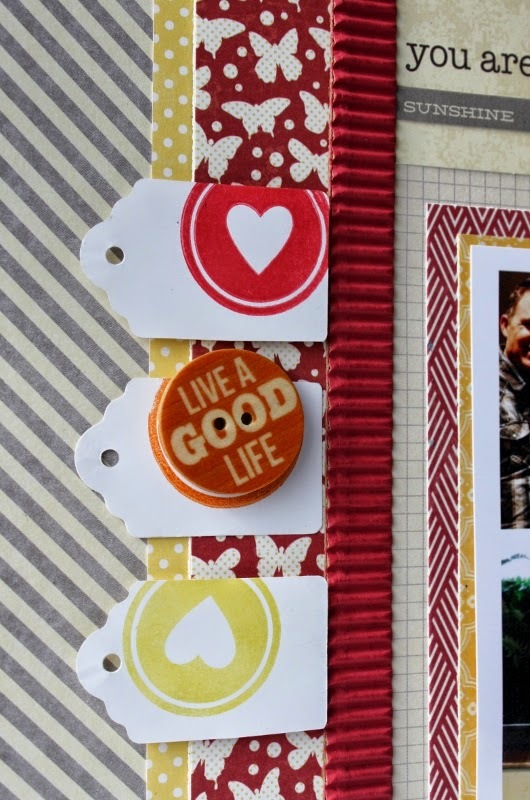 Next I stamped three circle hearts onto plain white tags in red, orange and yellow ink. Then I stamped the “Hello My Name Is” stamp in red ink onto white cardstock matted onto Orange Salt paper. Using a thin tipped black marker I wrote in “Child of the One True King”. Now I began to layout the design of the page I chose three flashcards from the Sightseeing Stew collection that applied to my theme topic and then added gray word stickers to further emphasize the definitions as it pertained to that day. 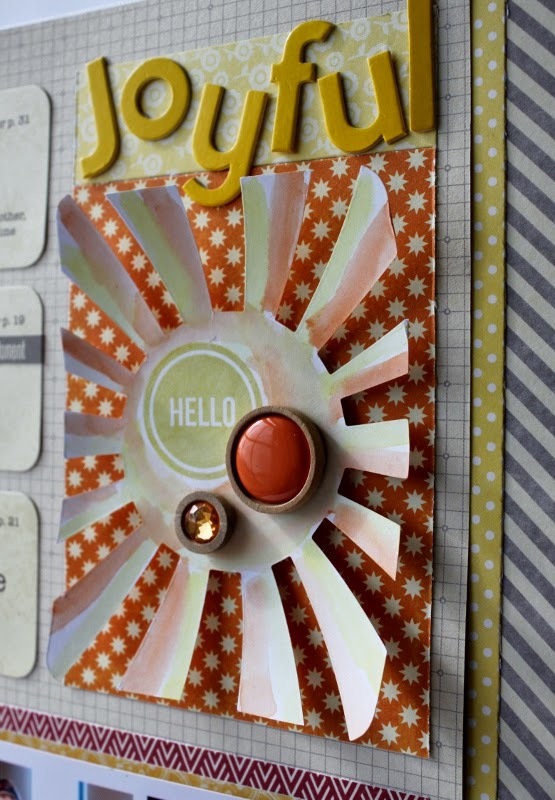 To highlight the sunshine die-cut I matted it onto an orange patterned paper with a yellow pattern topper. Onto the topper I added a title of “Joyful” in yellow Beanboard Alphas. I chose a gray diagonal stripe for the layout base and a light yellow mat with a red butterfly border strip on left with an additional border strip of rockin red corrugated paper to add texture. Then I printed the three photos in a collage format and double matted them in yellow and red patterned papers. To add the finishing touch I added one orange wooden nickel and two wood sprinkles in orange enamel and orange gemstone. This layout includes patterned papers from 8 different Jillibean collections, I really love how Jillibean Soup papers interchange so easily. A joyful layout to celebrate one of my favorite days ever, when our children begin their own journey of faith it is a beautiful moment indeed. 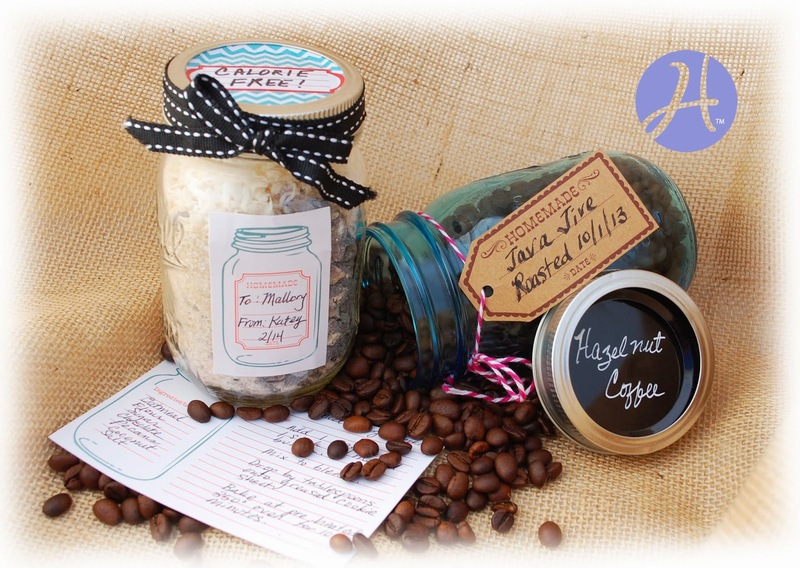 I encourage you to capture photos and layouts that document your family’s spiritual events. Today I made a set of mini cards using some fun Hampton Art products. I used the Jillibean Soup Sentiments clear stamp set, the Ki Growing Garden 6” x 6” paper pad, and some Studio G Mini Cards. These cards are pre-cut into fun shapes and make a big impact even though they are only about 3" x 3”! 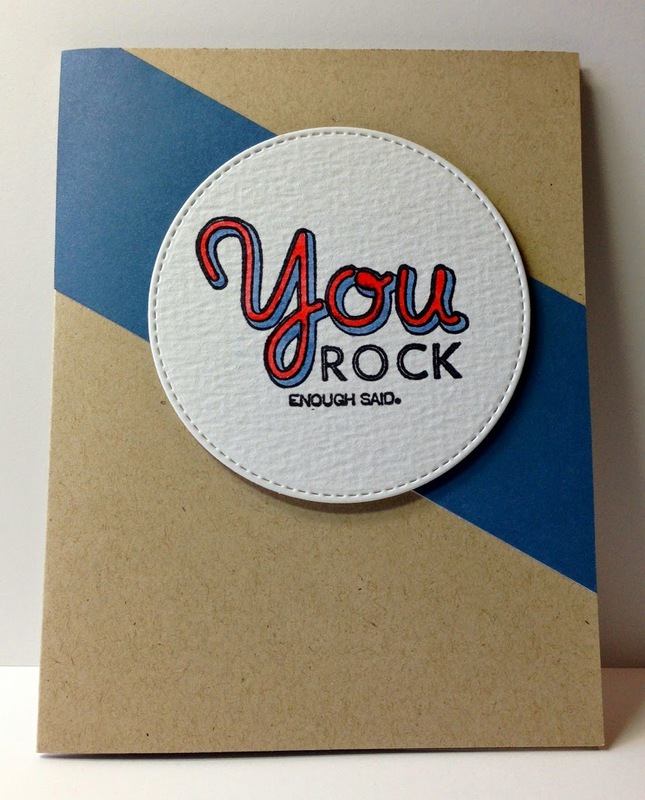 Mini cards are a great way to include a note with a small gift. Good morning Hampton Art followers ! 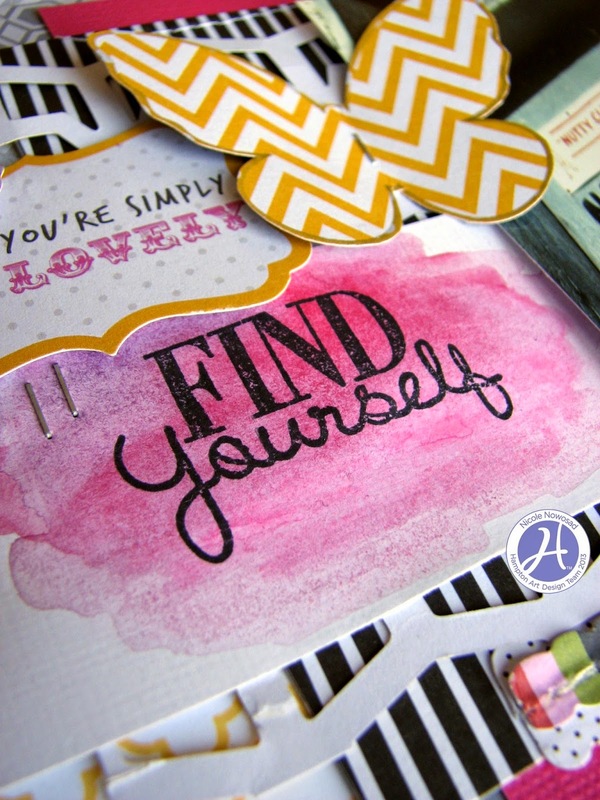 I am here today to share a quick page made with lots of Jillibean Soup stamps by Hampton Art. I started out by stamping several different patterns of stamps onto white cardstock, alternating my ink color with each shape. You can see that I tried to make a repetitive patter with each shape that I used to create my own patterned paper of sorts to use on my page. I added some droplets of mist and some machine stitching to the pieces and then backed them behind a die cut background to finish my page. I also used some watercolor paint on a scrap of cardstock and once dry, I stamped a small sentiment/title to add to my page as a tag next to the KI Memories butterfly and ruffle stickers. 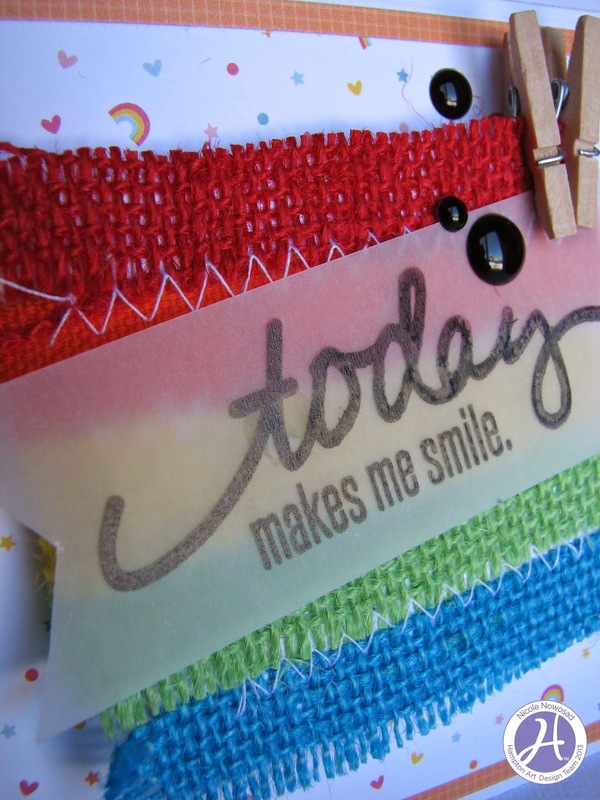 Today I am showing a fun way to use colorful Ki / Hampton Art Bakery Twine. I used a die to cut the heart in the center of the card front, then I repeatedly wrapped twine around a piece of paper, and mounted it on the inside of the card. I always need birthday cards, so choosing the sentiment was easy. For my projects this month I decided to give the new watercolor trend a try. 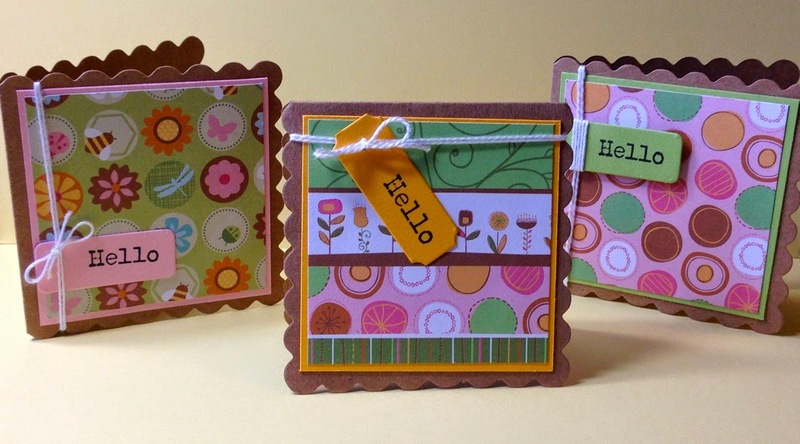 These cute little cards were my first attempt at watercolors in years, but they were actually very easy to create using a Hampton Art/Jillibean Soup stampable stamp and a couple Jillibean papers. 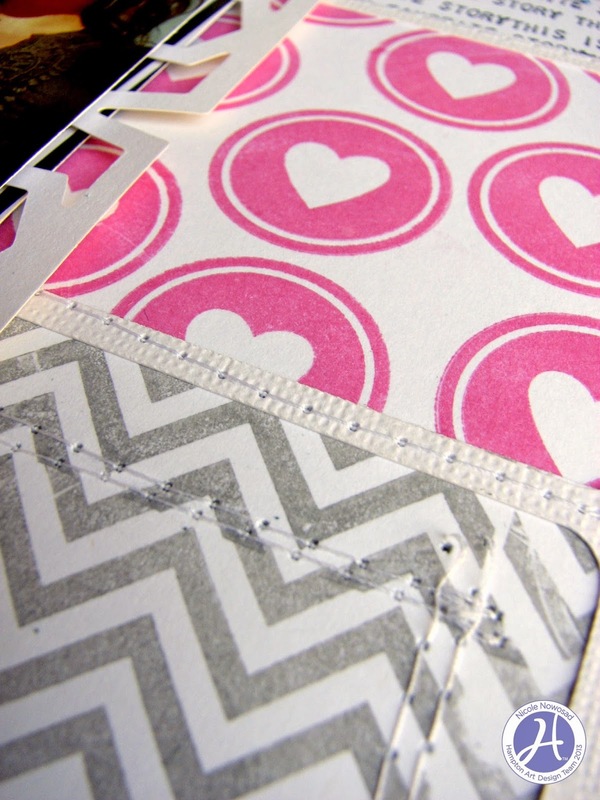 Next I cut the postmark pieces into heart shapes and attached to notebook design as shown with 3D foam dots. I cut two pieces of complementary Jillibean Soup papers from the Sightseeing Stew collection and used them as mats for my mini cards of white cardstock. Then I added the notebook pieces set at an angle with 3D foam dots. That was it, very simple cards. Perfect pair for a daily pick me up or to hide in a lunch or suitcase. So go find a watercolor set and give it a try, it is a bit addictive I have to warn you! 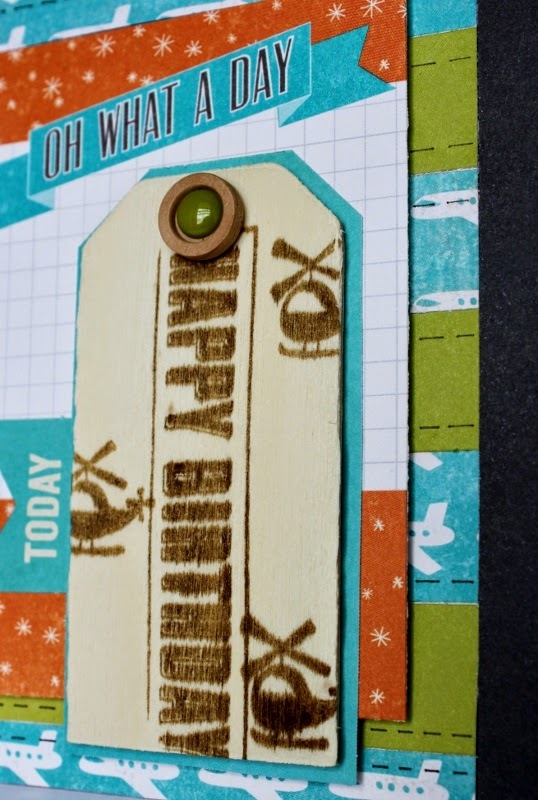 Hello and welcome to the Hampton Art blog... it's Melinda with you today and I'm sharing a card that incorporates one of the many trends making the rounds at the moment - the faux chalk board. I have often admired chalkboard projects I've seen on Pinterest and never really found the opportunity to give it a try. However, I really didn't have any excuse when the gorgeous new Hampton Art/Jillibean Soup Chalkboard Flags were produced. The faux chalkboard was simply a matter of using a good quality white ink when stamping the image and then having some fun making a few smudges and smears. Simple but really effective! I kept the black and white theme consistent across the card except for a touch of aqua to act as a highlight in breaking up the monotone. I made a sweet and simple card with the Jillibean Soup / Hampton Art You’re Tweet clear stamp set. Isn’t that bird a cutie? The card base is from Studio G / Hampton Art. It come pre-punched with the circle in the center! Today, I am sharing a card with you that I made only with a few tiny pieces of paper and mostly with stamps. 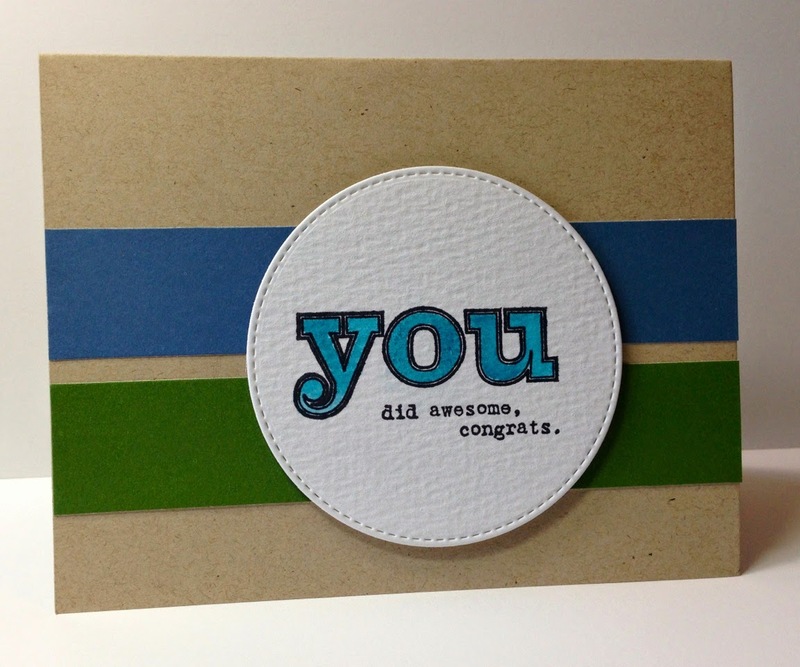 To create the card, trim white cardstock to size. 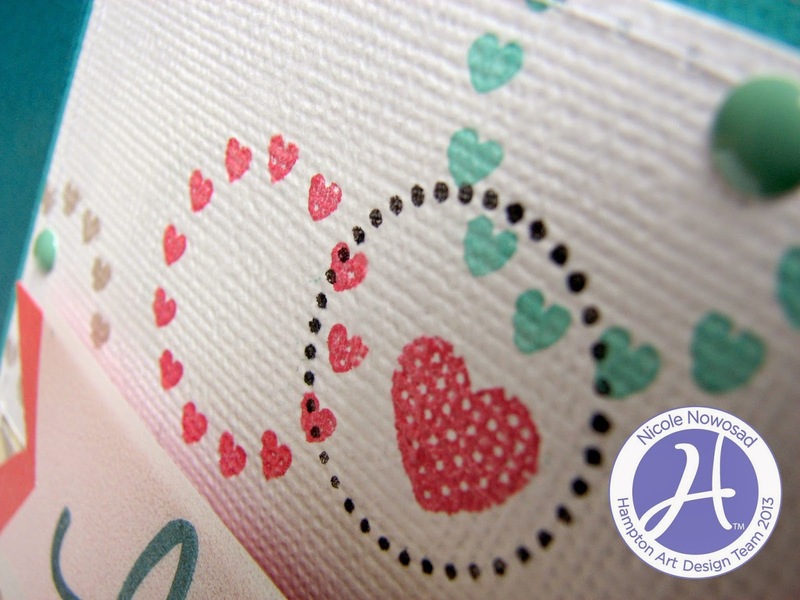 Using a watermark ink pad, stamp the word LOVE using the Jillibean Soup Heart Healthy Red Bean Soup stamps to the background. 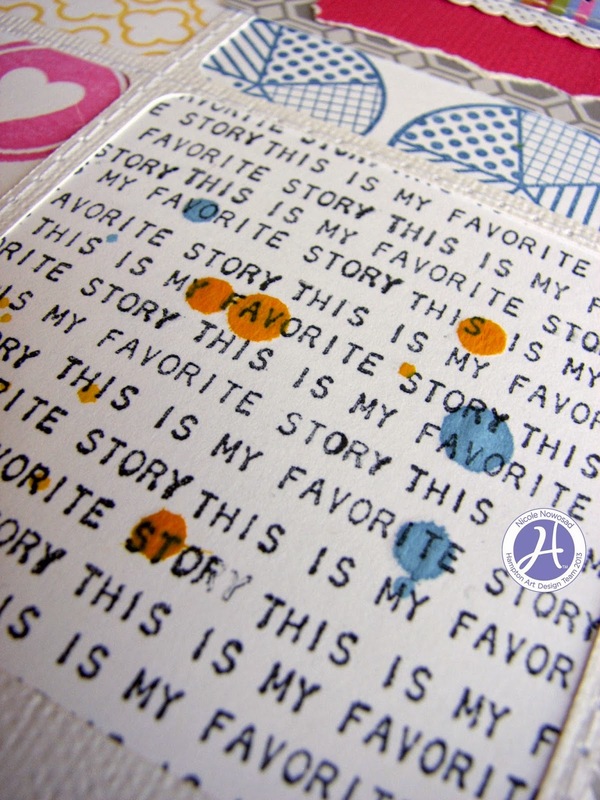 Next, using different colors of ink, stamp over your background using the circular stamps from the Jillibean Soup Tiny Stories stamp set. 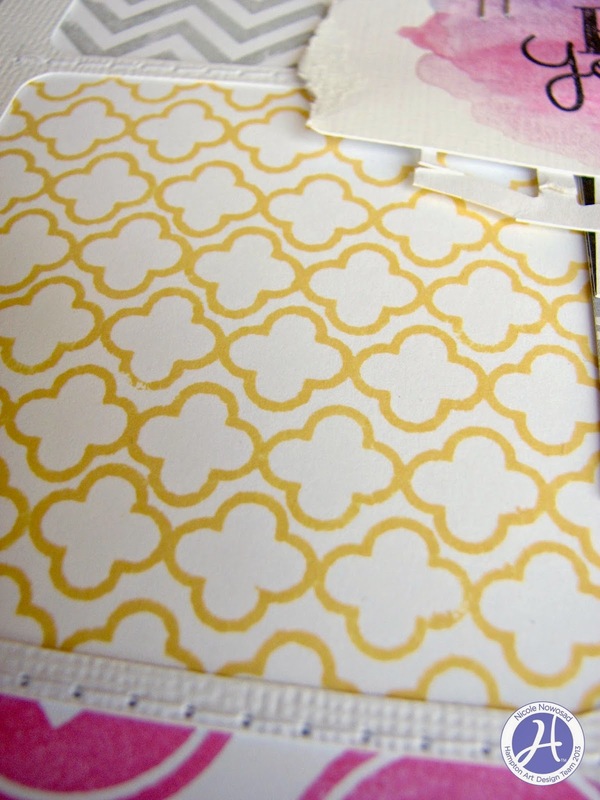 Change up the color and pattern of stamp used all over the back of the card in three or four groupings. 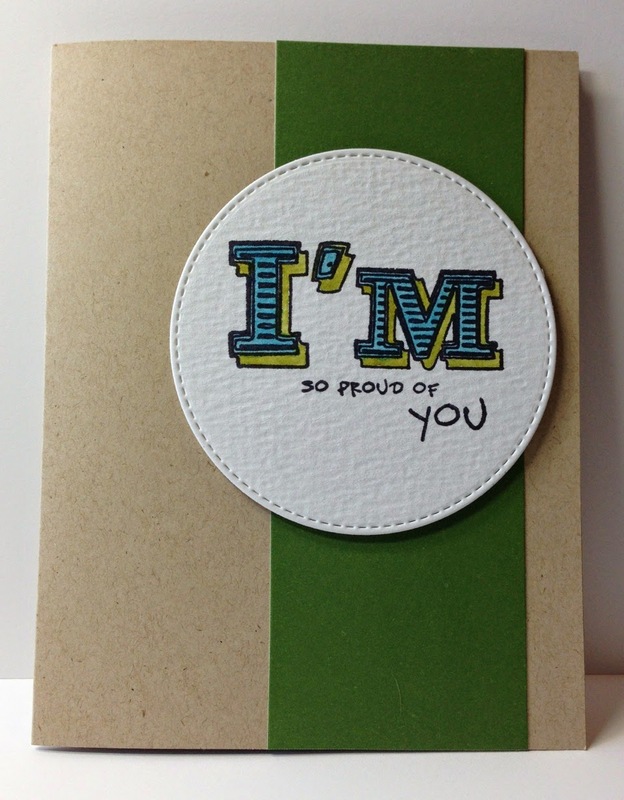 Add in your stamped sentiment title on a piece of cardstock or patterned paepr and your card is done!